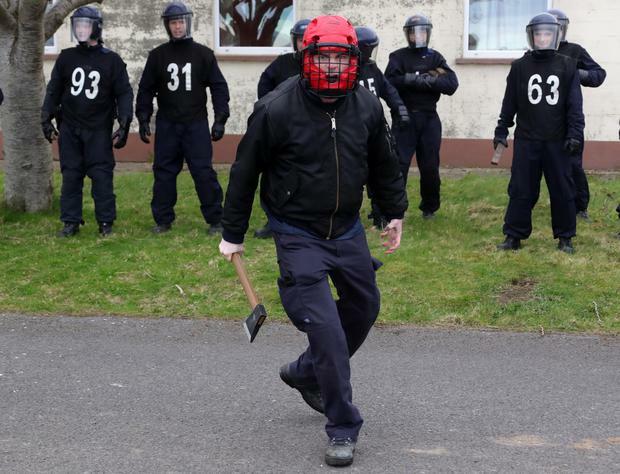 Gardaí tackled a man armed with a hatchet and faced petrol bomb 'attacks' - all in the name of public order policing training exercises. 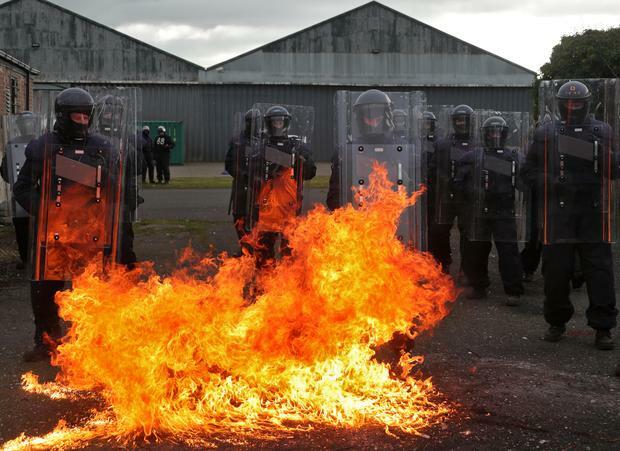 Gardaí have been undergoing weeks of training to qualify in public order policing to cope with withstanding missiles, petrol bombs and physical attacks. Exercises involve resistance to garda units from peaceful protesters, and controlled and staged violence which includes withstanding missiles, petrol bombs and physical attacks. Officers must also go through a number of intense fitness tests wearing full protective and fire retardant uniforms, and human rights training, to qualify for the unit. Pressed on whether Brexit has led to concerns over public order, gardai said such training takes place every year and they have "no big announcement" on the issue. Gardai highlighted increasing cases of violent, deranged persons (VDP), who may have mental health or drug problems and take hostages in a home or lash out against themselves. Inspector John Egan said it is often family members who are forced to call in the gardai, and such call-outs are a traumatic experience for both officers and witnesses. He said: "Unfortunately it is more common, a lot of the times it's at home, it's very unnerving for families. "My officers have to be trained, and be able to look after themselves, it might look aggressive at the outset, but if you have a knife or a samurai sword coming at you, you need the training and equipment to deal with that scenario, and for the safety and human rights of that person, they deserve full human rights, that's not them on a normal day and we have to remember that. "A lot of it is down to drug-taking, a lot of different drugs are available at the minute and people are taking prescribed and non-prescribed drugs." 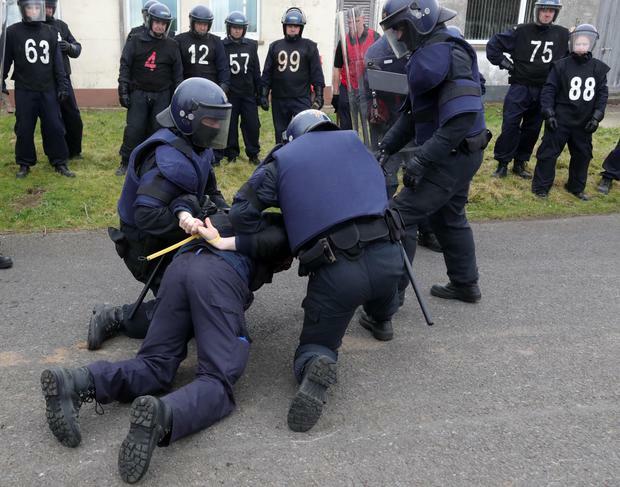 During the annual courses, garda members are trained and tested in their competence in public order policing skills. On a day-to-day basis, the unit deals with protest removal and policing of crowds at events like royal visits or St Patrick's Day. An upcoming visit by US President Donald Trump will see the unit's officers heavily involved. For protests, gardai say the Public Order Unit is only deployed when normal policing has failed. Officers from the unit have travelled to France, the US and a number of other countries, and work with organisations like Interpol to decide on best practice. Gardai have faced criticism in the last year for their handling of certain events, with particular scrutiny of the handling of an eviction in Dublin involving a private security company which saw some protesters hospitalised. Mr Egan added: "That's a matter for the Government, and is before the Government at the moment. "Gardai have a role in the public forum, not in the eviction of people." Ralph Riegel THE heartbroken parents of a toddler who suffered a complex brain injury after being knocked down in a hit-and-run revealed he is now sitting up in hospital but is still unable to speak or walk.